2010 is over. It ended much quicker than we wanted it to, but days always go too fast when you spend your time being sick or taking care of whoever is currently sick. This was the reason for the unexpected blog break for the last few months of the year. It was much needed and before the year was out we were all healthy and even got to spend a couple of days out of town visiting friends. I hope to share some pictures from the missing months. For now, I’m going to concentrate on the house while I have boys home. Or maybe we’ll go to the dairy and get some chocolate milk. Thank goodness! New pictures. 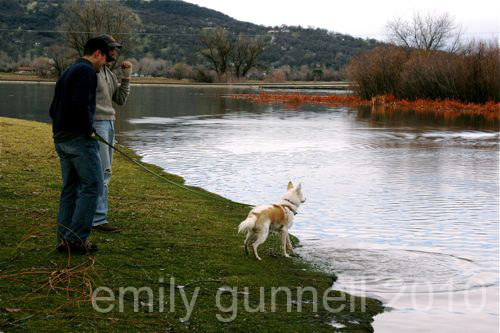 So if Sammy jumped into the water, does that mean he doesn’t always need a leash to stay with Don when out on walks? For me there are only a few, OK maybe only 1 person outside of my imediate family that shows such unconditional acceptance and love as Sammy/Houdini do. So glad you and your family are feeling better! Can’t wait to see more pictures soon. Can I go to the dairy with you??? I haven’t done that since I was a kid. It makes me a little jealous. Emily time to update site.